On Friday, April 20, 2018 at 4p in Center for Natural Sciences (CNS) C101, IWU alum, Bill Huber, who is the Technical Lead for First Solar, will give a talk comparing the trends among various types of energy production (various solar, wind, coal, gas, etc.). First Solar is the largest photovoltaic manufacturer in the country, making big-scale Solar Energy plants with 17 Giga-Watts of capacity deployed (not roof-top systems). Sponsored by the IWU Physics Department. This entry was posted in Uncategorized on February 17, 2018 by Ann Aubry. On Tuesday, March 27, 2018, at 7:00 p.m. in the Hansen Student Center, the IWU Environmental Studies Program and JWP Audubon will present Unfractured, a feature documentary about activist Sandra Steingraber (an alum from IWU) as she leads the fight against hydraulic fracturing in New York state. The following information was taken from the documentary web site (https://www.unfractured.com/). “A hopeful documentary about fighting with your whole heart, Unfractured follows introspective biologist and mother Sandra Steingraber as she reinvents herself as an outspoken activist and throws herself into an environmental war that many believe is unwinnable. Branded a “toxic avenger” by Rolling Stone, Sandra quickly emerges as a leader of New York’s biggest grassroots movement in decades. Determined to win an uncompromising battle with the oil and gas industry, Sandra decides she must fight with her whole heart—devoting all her time, energy, and money to the cause. But as the film opens, her personal life is thrown into crisis when her husband Jeff begins having one stroke after another. She knows her family needs her at home, but Sandra can’t stop—not until she and her allies win a state-wide ban on fracking. Co-sponsored by the IWU Environmental Studies Program and John Wesley Powell Audubon. This talk is free and open to the public. This entry was posted in Events on February 6, 2018 by Ann Aubry. On Tuesday, March 6, 2018, at 7:00 p.m. in the Hansen Student Center, Illinois Wesleyan University will present The Colorado, a feature documentary that creates a crossroads between art, ecology and regional history. The project’s director and co-author, Murat Eyuboglu, will introduce the film and discuss its development and production. The following information was taken from the documentary web site (http://www.projectcolorado.com/). “For five million years the Colorado has carved some of the most majestic landscapes on the planet. It has also become the lifeline of a vast portion of North America, providing the water that sustains nearly forty million people, half a dozen major cities, and an immense agricultural empire. Because of these demands, the river is so overused and overpromised that it no longer flows to the sea or nourishes its delta. The Colorado, set to music by today’s leading composers and narrated by the stage legend Mark Rylance, takes us on a journey in nine chapters through the prehistoric settlements of the region, the period of European exploration, the dam-building era, modern industrial agriculture and immigration, and the impact of climate change. The Grammy-winning vocal ensemble Roomful of Teeth, cellist Jeffrey Zeigler (Kronos Quartet), and composer-percussionist Glenn Kotche (Wilco) perform the film’s exhilarating score.” This talk is free and open to the public. Sponsored by IWU Provost Office. This entry was posted in Events on January 31, 2018 by Ann Aubry. Dr. Adam Dolezal, an Assistant Professor in the Department of Entomology at the University of Illinois, will talk about the “Interactive Effects of Environmental Stressors on Bees: Nutritional Physiology, Disease, and Landscape” at 4 p.m. on Friday, Feb. 16 at Illinois Wesleyan University in room C101 of the Center for Natural Sciences. Recent years have seen an explosion of interest in the declines of pollinators. It has become clear across the world that a variety of factors interact to contribute to the losses of these beneficial insects, both in managed (e.g., honey bee hives) and natural (e.g., native bees) situations. Dr. Dolezal is interested in how multiple environmental factors, specifically viral pathogens, nutritional deprivation, and pesticide exposure, interact to affect bee health in the real-world landscapes of the agricultural Midwest. This area is marked by some of the most intensive agriculture and highest crop yields in the world, which has resulted in a transformation of natural and semi-natural landscapes into efficient production of only a few crops. This talk will be geared for science students, but non-science students are also encouraged to attend. Sponsored by the IWU Biology Department. On Monday, February 5, 2018 at 7pm (in SFH 102) Joe Daniels ’13, Risk Manager for the Office of Pesticide Programs in the US Environmental Protection Agency (EPA) and Environmental Studies alum (International Environmental Sustainability), is returning to campus to share his experiences working at the EPA, including a recent mission with FEMA doing hurricane relief work in Puerto Rico. Joe is also a returned Peace Corps Volunteer, having served in Nicaragua for 27 months post graduation from IWU. This event is free and open to all at IWU and the public. Sponsored by the IWU Environmental Studies Program. Home and business owners in McLean County have an opportunity to take advantage of record low solar pricing through a limited-time solar group purchase program. Solar Bloomington-Normal is a solar group buy program that can help residents invest in lower cost solar installations through the power of volume purchasing. This free one-hour seminar educates homeowners, small business owners, and farmers on the benefits of solar energy and is the first step to participate in the program. This entry was posted in Events on September 2, 2016 by Ann Aubry. Talking Trash in the Dugout – New Year! New System! There is a new, simpler waste-sorting system in the Dugout this year. What’s changed? We are still composting food scraps, but can no longer accept soiled plates and other compostable materials together with food scraps due to a change in the disposal system. The good news is that it’s easier to know what goes in each waste bin: Food Waste (food only),Recycling (same as across campus), and Trash (anything that is soiled or is not food waste or recyclable). Not sure where to toss your waste? When in doubt, throw it out (in TRASH) to avoid accidentally contaminating the Food Waste and Recycling bins. This entry was posted in IWU in Action, News, Tips on August 29, 2016 by Ann Aubry. The Good To Go Commuter Challenge is back! Once registered, log in and record your daily commutes. Eligible modes include: biking, walking, taking the bus, telecommuting, and carpooling. It is easy and quick to find transit schedules, walking & biking routes, and find/create carpooling opportunities. Prizes will be awarded to the individual, the team and the employer with the most participation. This entry was posted in Bikes, Community, Events, IWU in Action, News on May 9, 2016 by Ann Aubry. Friday, May 20, is National Bike to Work Day. The Illinois Wesleyan Bike Coop will hold their first-ever tune-up event all day in the garage behind the IT House. Sign up and bring your bike in after 7:30 a.m. and they’ll do all the basics – lubricating the chain, tightening the brakes, etc. while you’re at your desk. The $20 fee will go to further develop the coop by allowing them to buy more tools, parts and accessories. Learn more and sign up here. This entry was posted in Bikes, Events on May 9, 2016 by Ann Aubry. A group of Illinois Wesleyan students went to Springfield on April 7 to lobby on environmental issues as a part of the Illinois Environmental Council Lobby Day. The effort was organized by Cameron McKee ’17, a double major in environmental studies and psychology who is an intern at the Illinois Environmental Council. 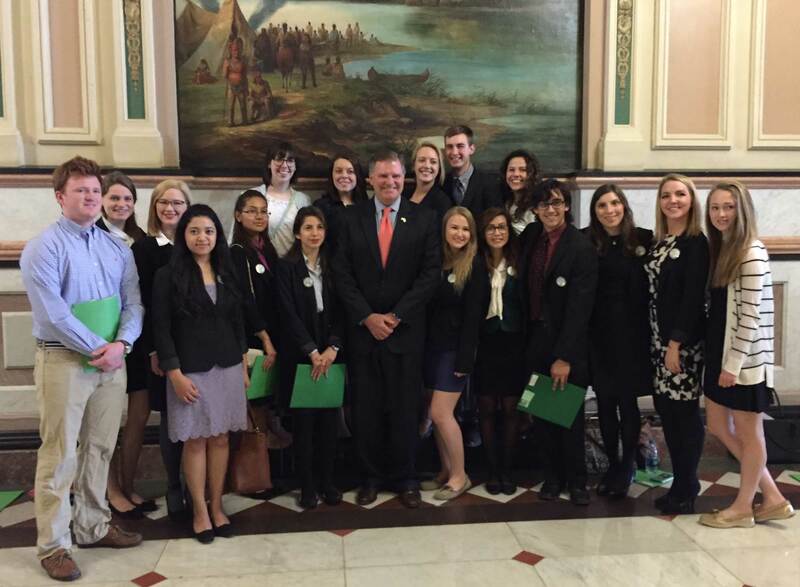 While in Springfield, the students met with Illinois Senator Bill Brady ’83 (who posed with the group). This entry was posted in IWU in Action on April 15, 2016 by Ann Aubry.